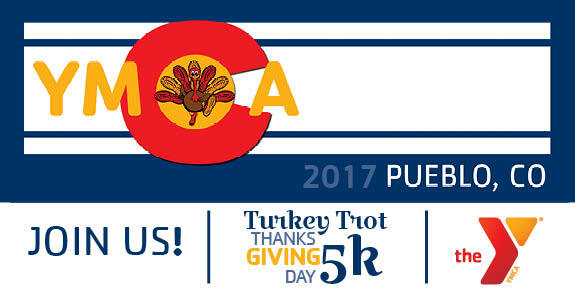 Join us for the YMCA of Pueblo's Annual Turkey Trot 5K Run/Walk and 1K Kids Fun Run! Every dollar raised goes directly to our Scholarship Assistance Fund. Thanks to community supporters like you, more neighbors, youth and families are able to access Y programs regardless of ability to pay. We truly believe that we are #strongertogether. -Race Day Registration in YMCA lobby 7:00-8:30 a.m.
-1K Kids Fun Run begins at 8:15 a.m.
-5K begins at 9:00 a.m.
-5K starts in front of the YMCA. Northwest on Spaulding Ave. to Parker Rd. North on Parker Rd. North on Parker Rd to dead end. Turn around at dead end and head south on Parker Rd. to Spaulding Ave. Southeast on Spaulding Ave passing the YMCA. West to Pueblo Blvd. Turn around at Pueblo Blvd. and head back east on Spaulding/31st Street. End at the south entrance of the parking lot. -1K starts in front of the YMCA and goes once around the YMCA grounds. Registration goes to $40 after November 22.